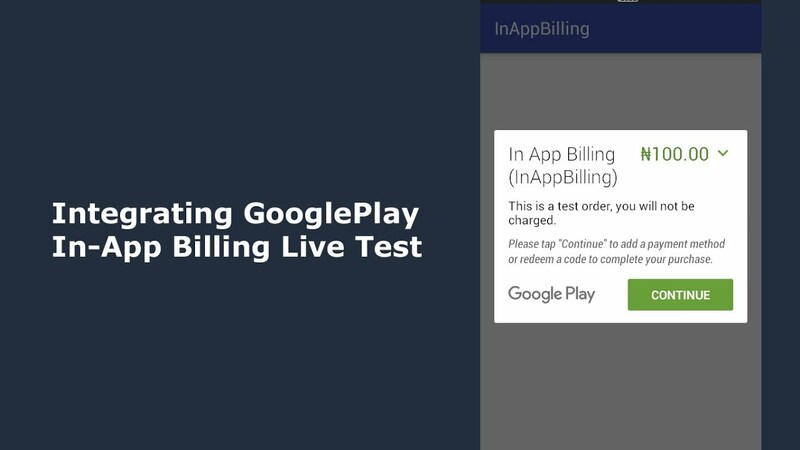 This is the concluding episode of integrating google play In-App Billing into an Android App, this time with the live Test and also pushing the application from the google developer console to the google play store with the in-app purchases configured. A most watch for developers that want to monetized or become a google application merchant. I successfully followe your tutorial and tried to do an effective payment using my personal google account. The payment was successful but I didn't receive the money. Is there something missing? where the money goes to if we buy the product? the CC registered? can we change the CC? Hello, great video, but WHAT am I buying ? I please want to know how to activate an option of the app. I am currently testing In-App Billing for a future app, and after I successfully "bought" the test item and again login login he's saying again buy this product. Excellent video btw im confused about where the amount is credited or stored ..
when users purchase our product where the money is saved? If you want to implement ads from any network or IAPs into your project in a matter of minutes, check out how Enhance can help you! I am geting this message. but my item is reusable. Any user can buy it multiple times. How to implement it? how to secure inApp billing code from reverse engineering, I mean to secure APK. And how to ad remove ads button in android apps..
Nice tutorial, what if I don't want to use credit/debit card but airtime in the device(SIM)? Bros thanks for the video… I will love to work with you and send those dollar to Naija instead of other places. We have to hardcode product id in apk. But there is a pre requiste to upload apk to create Product on Google Console. How's that possible? I'm working on a subscription, but the user does not get back when I turn it off and buy it when I open the app. QueryInventoryFinishedListener I check in this class but I can not get the results? Click me button is not enabled after the payment is successful. Kindly guide. hello you just gave demo,we need some advanced like how to add the extra tabs or adfree processes through in app billing.and thanks for the above video. what is "mypurchasetoken"?? Will I get it from developer consol?? Thanks for your presentation. It was helpful. I would like to have 2 in-app products to offer my app users. 1. Can you explain how the InAppBillingActivity.java class should be modified to enable 2 separate in-app products to be set up? 2. In addition, what change needs to be done to the activity_in_app_billing.xml layout file? HI Can you do a video on in-app purchase to remove ads? Thanks! Would it be possible to contact you about a problem I'm having somewhere? I've been trying to implement in app billing for 2 days and can't seem to get it working.. love your tutorials.. it seems Im getting an NPE error when clicking button to open purchase.. anywhere we can chat so you can view code see if theres any errors? Thanks! How do you test this? So you have to submit a production level version in order to add in-app items to the dashboard? Is there not a testing sand box that you try this out before you submit a production APK which in turn would then be short lived as the code you add and test after creating items. This seems backwards? Also when did you add the base64 key? Great video. Thanks. I have one question tho. In the TrivialDrive example from Google, there was an implementation of the BroadcastReceive, I see that you don't have it here; do you actually need it for an actual app?